Arcwind Point is a ruined Nordic structure located at the southern edge of Skyrim, south of Ivarstead. This entirely outdoors location is actually several separate ruins. It is guarded by skeletons, high level draugr, and once you have completed Dragon Rising, a dragon. The ruins can be reached by a path south of the Rift Imperial Camp, or another path between Froki's Shack and Autumnwatch Tower. The former route can be awkward to find the beginning of the path. The easiest way to find it is to leave the Imperial camp via the southeastern exit. Ahead on your right is a corundum ore vein beside a canis root. If you turn and head due west you'll join up with the early part of the path. The latter route also has a canis root near the beginning and a couple of snowberry bushes along it as it zigzags up the mountainside. You may also alert the dragon roosting on Autumnwatch Tower unless you choose to deal with it beforehand. Just after the path turns west and widens there is an altar with three random potions on it and two draugr on or in front of it. You can also reach this path by climbing the mountain immediately to the right of Froki's shack. At the top is a shrine of Talos. From here dropping down the mountain to the west brings you to where the second of the paths turns west and widens. Continuing along the path heading west you are likely to face two leveled creatures near a circular barrow, the type with a covered passage around a central circular chamber. On the right, just before it is a quicksilver ore vein. The barrow is nearly filled with snow and ice and to reach the center you need the right-hand path. In the middle chamber is an unlocked chest with a dead Nord beside it. Further along the path heading west, it begins to descend. Ahead is a square stone arch with a sunken barrow beyond it. As you near use of detect dead will reveal a draugr slumbering in an upright sarcophagus. Any noise fighting the draugr may alert several skeletons to your presence and cause them to converge on you. There are two paths continuing to head west from here, most of the ten skeletons are found along the southern of the two paths, as is a second quicksilver ore vein. 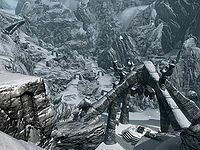 You may also encounter the dragon at any point from here onward, as it is regularly disturbed by up to two leveled draugr found near the word wall, who it may be found fighting against. To the north is the other path that leads to these ruins. The two paths re-merge just before a huge structure made from interconnecting arches, with a raised platform in the center and stairs on each side leading up to it. On the platform is a sarcophagus containing a highly leveled draugr. If you have Dawnguard installed, a series of flights of stairs to the west lead up to a word wall, which teaches a part of the Drain Vitality shout. To the north are more flights of stairs rising up to another building. In front of the entrance, which is an open doorway is a pressure plate that triggers a battering ram from the entrance. The building is narrow with two large openings on the other side, with a stone table between them holding a random potion of magicka, a random potion of resist cold and a random poison. Upon exiting out the other side another highly leveled draugr will burst from an upright sarcophagus which is against the side of the building and between the openings. To the west is a grave with a nightshade plant beside it and further west is a third quicksilver ore vein on the ground. There are two more rows of graves opposite the building with several more nightshade plants. To the east you can see a tower with stairs leading up to it. Take care as two more draugr are patrolling in front of this and at higher levels both may use the Unrelenting Force dragon shout, which may knock you off the mountainside and can kill you. Inside the tower is empty except for the top two floors. There is an unlocked boss-level chest on the second to top floor and a skeleton that you can loot in front of a pedestal holding a copy of the Restoration skill book Withershins. The draugr in the sarcophagus past the small building containing traps can be unusually powerful relative to your level. For example, at level 15 you could find a Draugr Death Overlord here. In this case, the defeated enemy could drop an ebony weapon, making this spot useful for finding ebony weapons earlier in the game than they are generally accessible. There is little or no space for the dragon to land or crash in the Arcwind Point site itself. The dragon may fly over the mountain to the north to land. Killing the dragon here does not mark the location as cleared, because it is not tagged as a boss. This bug is fixed by version 2.0.3 of the Unofficial Skyrim Patch. If sent here for the Words of Power quest, finding the word wall may not mark the quest as completed in your journal. This bug is fixed by version 1.1 of the Unofficial Dawnguard Patch. Using the command SetStage FreeFormHighHrothgarA 20 will end the quest and allow you to acquire another quest normally. Setting Arcwind Point as cleared via SetLocationCleared fd685 1 will prevent getting sent here again. Going to Northwind Summit and collecting the shout there should clear the quest, but only if you haven't already learned that word, and you may be sent to Arcwind Point again in the future for the Word of Power quest since it won't be marked as cleared. The dragon that spawns here is almost always bugged. The most common bug for this dragon is blurred skin, which is listed on the dragon page. After using the Dragonrend dragon shout on the dragon, it may fly away and may not respawn even after waiting 10 days. ? This page was last modified on 26 November 2018, at 01:13.